The early pages of Nature’s Patchwork Quilt by Mary Miché tell the reader that “[n]ature is like a patchwork quilt. 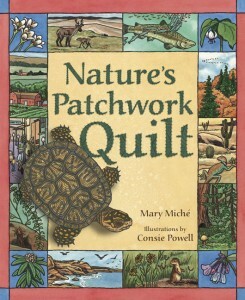 It has many different habitats all pieced together to create our wonderful planet.” With large pages filled with visual detail, the entire book follows a quilt motif – instead of differing fabrics there are different animals and environments pieced together to help explain how interdependent we all really are. When my husband began reading the book to our four year old daughter he remarked on how much he liked it and I enjoyed it as well. Dawn Publications sent a review copy of this title.